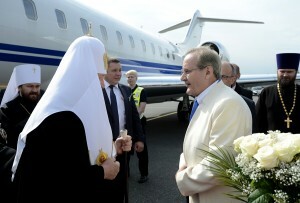 On June 14, 2013, His Holiness Patriarch Kirill of Moscow and All Russia has arrived in Estonia. At the airport, he was met by Metropolitan Cornelius of Tallinn and All Estonia, Bishop Lazar of Narva and Prichudye, Estonia’s State Secretary Heiki Loot, Russian ambassador to Estonia, Yu, Merzlyakov, and Belarus’s Charges-des-Affaires V. Lazerko. The delegation accompanying the Primate of the Russian Orthodox Church includes Metropolitan Hilarion of Volokolamsk, head of the Moscow Patriarchate’s department for external church relations, Bishop Sergiy of Solnechnogorsk, head of the Moscow Patriarchate’s administrative secretariat, Archpriest Vsevolod Chaplin, head of the synodal department for church-society relations, V. Legoida, head of the synodal information department, Archpriest Nikolay Balashov, DECR vice-chairman, Archpriest Igor Yakimchuk, DECR secretary for inter-Orthodox relations, Protodeacon Vladimir Nazarkin, assistant to the DECR chairman, and M. Kuksov, head of the Patriarchal personal secretariat. ‘I have been to Estonia many times. My childhood is linked with Estonia. As a child and later as a youth, I came here on many occasions, as my parents used to stay here in a country house, and I came to stay with them. I also made several pilgrimages to the Pukhtitsy Convent. I feel close to Estonia as a country as well, to her people, her customs, her culture. ‘I have come to Estonia for the celebrations to mark the event in which 20 years ago my late predecessor Patriarch Alexy II signed the Tomos of the Autonomy of the Estonian Orthodox Church and granted her the right of self-governance. It was a very important event which laid a foundation for further consolidation of Orthodoxy in Estonia. ‘As always, the most important thing I will do is prayer at shrines and celebration. A new Orthodox church will be consecrated. I hope to come to Narva and the Pukhtitsy Convent. Right now we will go to St. Alexander Nevsky’s Cathedral to celebrate a thanksgiving. The program also includes a meeting with the leadership of the country, which I believe is very important considering that the religious factor has always played and will play an important role, among other things, in the development of relations between countries and peoples. God willing, relations between Russia and Estonia will improve for the benefit of people in both countries’. Answering the question of how he assessed the situation of the Russian Orthodox Church in Estonia, Patriarch Kirill said he assessed it in the context of the existence of the Estonian Orthodox Church, whose autonomous rights were confirmed by His Holiness Patriarch Alexy II twenty years ago. ‘The life of the Church continues to develop despite certain circumstances, which, being a vestige of the conflicts in the 90s, have not been overcome as yet. We very much hope that all these problems will be resolved. The Estonian Orthodox Church is a Church of Orthodox people living in Estonia. She is not a representative of a foreign state, much less an agent of a foreign state who works for it. It is a local Christian Orthodox community which goes back to hundred and hundred years ago and has a very rich history. We hope that the repercussions of the upheaval of the 90s will come to an end in Estonia as well’, His Holiness said. From the airport His Holiness went to St. Alexander Nevsky’s in Tallinn. After the thanksgiving, he will lay a wreath at the Monument of Grief (Monument to Linda) and at the Bronze Soldier in the military cemetery and will have a talk with war veterans and youth. Later His Holiness will meet with the Estonian state leaders and Tallinn Mayor Edgar Savisaar. Tomorrow His Holiness will celebrate the Divine Liturgy at the Pukhtitsy Convent. In Narva, he will visit the Cathedral of the Resurrection and the social center at the church of Our Lady of Narva. On June 16, Patriarch Kirill will consecrate the church of Our Lady ‘Quick to Hearken’ at the Lasnamae district in Tallinn and celebrate the Divine Liturgy in the newly consecrated church. In conclusion of his visit Patriarch Kirill will attend the reception to be given by the Estonian Orthodox Church and meet with Archbishop Andreas Pӧder, head of the Evangelical Lutheran Church in Estonia, at the Dome Lutheran Cathedral in Tallinn.